Official demographic forecasts have always been too timid about future increases in life expectancy, and according to Nico Keilman, continue to be so even today. There are reasons for this downward bias but also grounds for concern, especially when governments rely on these incorrect predictions in the design of health or pension systems. 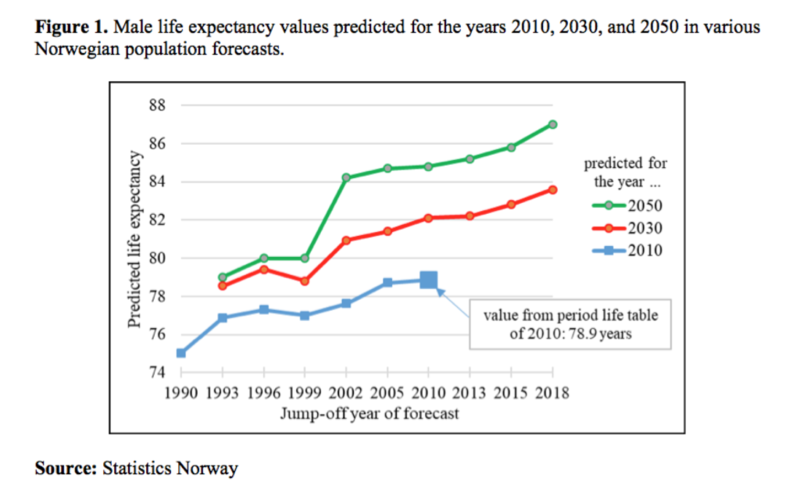 Norway and others: incapable of predicting life expectancy accurately? In June 2018, Statistics Norway (2018) published its latest population forecast. The agency expects that the average length of life of men will increase to 87 years in 2050. This is six years more than the current value of 81 years. In a forecast published in 1993, the life expectancy prediction for 2050 was eight years lower than in today’s population forecast. For women, the life expectancy prediction for 2050 increased by “only” four and a half years – from 84.5 years in the 1993 forecast to 89 years now. Demographers and other social scientists, in Norway as well as in other developed countries, have systematically underestimated the rate of life expectancy increase. 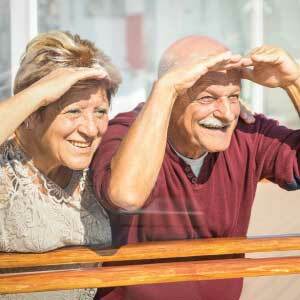 Governments should be concerned about stronger ageing than official forecasts suggest. In the population forecasts published approximately every third year between 1990 and 2018, Statistics Norway predicted ever-higher life expectancy values ​​for men in 2010, 2030 and 2050 (and other years, not shown here). Figure 1 shows how much the agency adjusted men’s life expectancy forecasts for 2010, 2030 and 2050 each time they updated their calculations. Almost without exception, the forecasts were higher. For women, the picture is the same, but the adjustments were a bit smaller. There is no reason to assume that the situation is very different in other developed countries. Pison (2018), for instance, notes that official French forecasts of life expectancy at birth published by INSEE between 1970 and 1995 all underpredicted the actual values. This confirms earlier findings for many developed countries (Keilman and Pham 2004). Up-to-date information of the kind shown in Figure 1 is only available for Norway. However, a re-analysis of data collected by Keilman and Pham (2004) reveals the same patterns for older forecasts for Austria, Denmark, Netherlands, Norway, Sweden, and the United Kingdom (Figure 2). 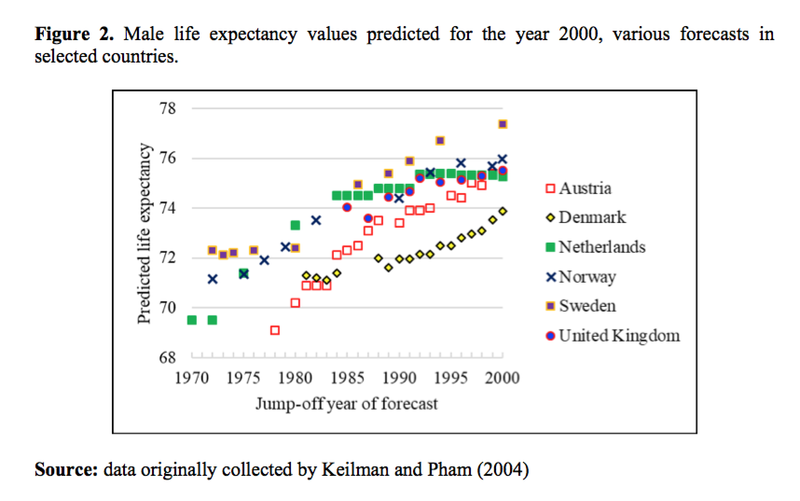 All life expectancy values in Figure 2 relate to assumed values for the year 2000, according to official population forecasts published by statistical agencies in six countries before 2000. The trend is clearly upwards, from 70-72 years in forecasts of the early 1970s to around 76 years in forecasts of the late 1990s. As in the case of Norway in Figure 1, the pattern for women in these six countries is similar, but the increase is slower. Why is life expectancy increasing more rapidly than expected? Why were demographers and other social scientists not more optimistic about people’s length of life? Pison (2018) suggests that French forecasters long underestimated the increase in life expectancy because they did not anticipate the sharp drop in adult mortality, old-age mortality in particular. There is no reason to assume that the situation was different in the six countries in Figure 2. The decline in cardiovascular mortality explains much of the drop in adult mortality during the past fifty years. Falling numbers of cancer deaths contribute also. Forecasters did not foresee this decline, and relied heavily upon observed trends. Longevity improved only slowly during the 1950s and early 1960s, in particular for men. In some countries, there was even a decline. Therefore, forecasters assumed that the life expectancy would increase very little in the immediate future, and that it would soon reach a maximum value (“ceiling”, or “limit”; see Oeppen and Vaupel, 2002). Indeed, five countries of Figure 2 used such a ceiling: Austria (until the 1990 forecast, in which mortality was kept constant after 2015), Denmark (forecast of 1997, constant after 2012), Norway (forecast of 1990, constant after 2010), Netherlands (forecast of 1995, constant after 2010), Sweden (forecast of 1994, constant after 2025). During the 1990s, however, the forecasters in these countries dropped the idea of a ceiling, and started to extrapolate a much more systematic increase in future life expectancy, although not steep enough. French forecasters used a life expectancy ceiling up to the forecast published in 1986, but gave up this idea starting with the forecast published in 1995 (Pison 2018). Forty years ago, Ascher (1978) analysed fertility forecasts in developed countries and noted that forecasters tend to rely strongly on recently observed data; they give less weight to the long-term trend. This “assumption drag” holds for mortality, too. Another possibility is that forecasters will learn from the errors they make, although this is easier said than done. For instance, a (naïve) straight-line extrapolation of the green line in Figure 1 would lead to a life expectancy of Norwegian males in 2050 of 97 years. This appears to be a bit high although, probably, not by much. After all, there is no sign that the upward trend in the green line will flatten out soon. It is likely that the true value in 2050 will end up closer to 97 years than to the current, timid projection of 87 years. We have witnessed a huge increase in human average length of life – one of the greatest achievements of mankind in modern times. However, it also creates challenges for, among other things, public pensions and national health care systems. The challenges caused by ageing populations are larger than what official population forecasts suggest. Governments of developed countries should be concerned. Ascher, W. (1978) Forecasting: An appraisal for policy makers and planes. Baltimore: Johns Hopkins University Press. Keilman, N., Pham, D.Q. (2004) Empirical errors and predicted errors in fertility, mortality and migration forecasts in the European Economic Area. Discussion Paper no 2004/386. Oslo: Statistics Norway. Human Mortality Database – HMD (2017). University of California, Berkeley (USA), and Max Planck Institute for Demographic Research (Germany). Available at www.mortality.org. Oeppen, J. and Vaupel, J. (2001) Broken limits to life expectancy. Science 296(5570), 1029-1031. Pison, G. (2018) 1968-2018: Four demographic surprises in France over the last 50 years. Population & Societies 553, 1-6. Statistics Norway (2018) Norway’s 2018 population projections: Main results, methods and assumptions (by Astri Syse, Stefan Leknes, Sturla Løkken, and Marianne Tønnessen. Discussion Paper no 2018/22. Oslo: Statistics Norway. ¹HMD data on cohort life tables for Denmark, England and Wales, Finland, France, Iceland, Italy, Netherlands, Norway, Sweden, and Switzerland.